Are you wasting nutrients on your farm? 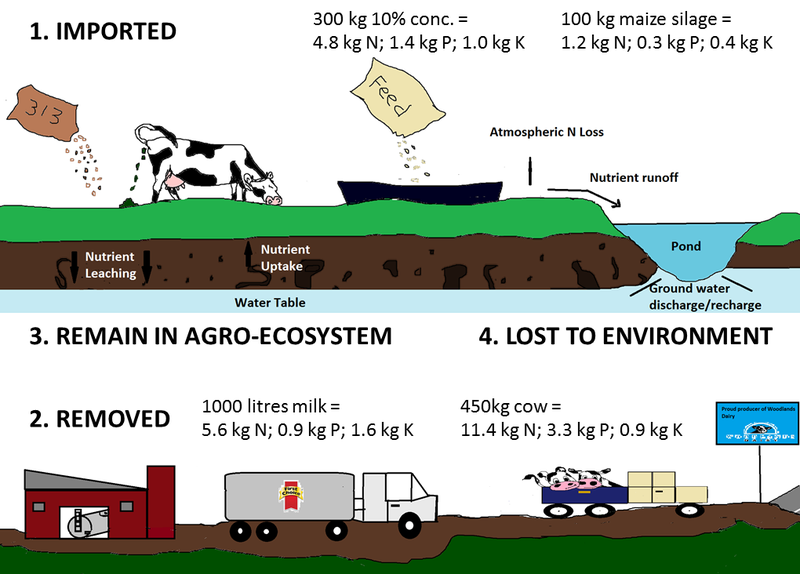 On any farm there is a cycling of nutrients (e.g. nitrogen, potassium, phosphorous, calcium, magnesium, sodium and sulphur) between the soil, plants and the animals which eat these plants. These nutrients are important for growth and production in both plants and animals. This cycle of nutrients is not a closed system within a farm though. Nutrients can be brought into the system, either naturally (e.g. mineralisation or nitrogen fixation) or through artificial sources (e.g. fertilizer), or lost. They can be lost through removal of products (e.g. crops, animals) or naturally (e.g. leaching). On a dairy farm this cycle takes place specifically between soils, pastures and dairy cows. Some of these nutrients are removed from the farm in the form of milk or in the bodies of animals which are sold. Many nutrients are brought onto the farm as well, in the form of fertilizers and feed (concentrates and roughage). It is important to ensure that there is a balance between what nutrients are brought onto the farm and what nutrients are removed from the farm. Many nutrients are wasted on dairy farms due to oversupply through inputs from fertilizers and feeds. A great deal of nutrients, and therefore money, can be saved by recording and monitoring what nutrients are removed from the farm and what nutrients are brought onto the farm. This will allow a farmer to balance the nutrients and provide an account for the addition and removal of nutrients on the farm. In addition to increasing efficiency of nutrient use on the farm, accounting for nutrient inputs and removal results in less waste of nutrients. This ensures fewer excess nutrients which often end up polluting freshwater resources. The pollution of groundwater and rivers by excess nutrients has a very negative environmental impact1. These water resources are important to long term agricultural success and therefore ensuring minimal pollution through excess nutrients is imperative for sustainable agricultural practices. What happens to nutrients on your farm? Spears RA, Kohn RA & Young AJ. 2003. Whole-farm nitrogen balance on western dairy farms. Journal of Dairy Science 86:4178-4186. Craig is a sustainability researcher. He studied Conservation Ecology at Stellenbosch University before joining the Trace & Save team in January 2013. He is passionate about environmental stewardship and the sustainable use of natural resources for food production. Craig loves travelling and tries to go on an overseas adventure to new and interesting places every opportunity he gets. He loves an engaging conversation or a good book. He is a bit of a coffee snob and foodie, so be sure to let him know about any new and interesting coffee shops or restaurants he should try out. He is also a big sports fan, most notably of the New England Patriots. Trace and Save | Don’t expect miracle pastures from nitrogen alone on So how do you actually go about building carbon in soil? Trace and Save | Happy soil life, happy grass, happy cows on What if agriculture could actually have a positive impact? Better water use efficiency can result in greater profitability Why carbon footprints on farms?